What do STAR TREK: DISCOVERY and GAME OF THRONES have in common? Answer: they each have only six episodes left to complete their story lines. Oh, I know that Discovery has been renewed for a second season. But up until that recent announcement, and all during the writing and filming of the 15 episodes of the first season, the production team didn’t know if they’d get a second season or, even if they did, if the setting and time era of the show would shift (as original show-runner Bryan Fuller has initially envisioned). So the idea was always to wrap up the Klingon war story in a single 15-episode (originally 13-episode) season. If the series got renewed, great. They’d do a new story arc during season two. The problem, of course, is time. While Game of Thrones has had SEVEN seasons and 67 episodes (so far) to slowly develop their many intricate plots and sub-plots and mysteries, move their characters into unexpected situations, and quite often surprise the viewer, Discovery has actually had to “rush” things. The Klingon war – there hasn’t been enough time to really show viewers the war, so we have been mainly told about it. Have you noticed how little actual fighting we’ve seen? How little strategizing? We only find out about that stuff after the fact—an “oh, by the way…” Deep Space Nine had three or four season to slowly develop the Dominion War…and so we saw a lot of it from many different perspectives—the fighting, the strategies, the subterfuge, and the aftermath of combat. We even got to see it from multiple perspectives: Starfleet, Bajor, Cardassia, the Klingons, the Founders, the Vorta, and even the Jem’Hadar. In Discovery, we’ve seen surprisingly little of the horrors of this war. Starship Troopers, this ain’t! In fact, the Klingon War that’s supposedly going on feels very removed from what we’ve seen of day-to-day life on the USS Discovery. Character development for the crew – Burnham’s shipmates have very quickly shifted from being dicks to her when she arrived to being much more professional and Starfleety. Stamet’s character had barely been established as a complete chip-on-his-shoulder schmuck before the spores turned him into a flower-child. I never got to really know him before the ‘shrooms, so it’s hard to figure out whether he’s become something different or not. And Ash “McDreamy” Tyler went from a 7-month POW to Chief of Security faster than a spore jump! Predictability – As I mentioned in a previous editorial review, I’ve found many of the “surprises” in this series thus far to be anything but unexpected. 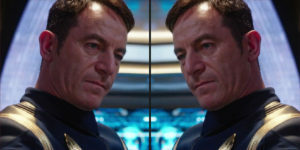 A number of fans have already figured out two very likely plot “twists”>>>THIS IS YOUR LAST SPOILER WARNING, PEOPLE<<<Lorca is from the Mirror Universe and Ash “McDreamy” Tyler is really the Klingon Voq (lots of evidence for that one). But some folks still don’t believe me about Mirror-Lorca. So I’ve edited together a few short videos from the most recent episode to convince even the most dubious fans. To be honest, if Tyler isn’t really Voq, I’m going to be pretty disappointed in the writers for setting up the above scene and not following through on it. But I’m pretty much convinced I won’t be disappointed. Tyler is Voq, folks. The writers just have to explain why this Klingon-in-disguise was able to “return” to Starfleet so easily. Maybe they put Voq’s brain into Tyler’s body…or at least transferred his consciousness…who knows? I just want the writers to make sure we get a believable explanation. Now, from the above scene , we now understand why the decision was made to have the Klingons speaking with subtitles in the first place. It was all so that they could have this scene with Burnham and the universal translator. All well and good, but the trade-off was having scene after long scene with seemingly-endless, exhausting-to-read subtitles and almost no perceptible emotion from the actors reciting those lines in a made-up language. Was it worth it? Personally, I don’t think so. Listening to how much more arrogant, capricious, and menacing Kol sounded when the actor was allowed to deliver his lines in English, I almost wept for all those scenes where this actor and others were nearly wasted delivering pages and pages of script dialog in a language none of them understood or could reasonably connect with. So is any of this a “bad” thing? No, not really. Although the decision to have the Klingons speak for minutes on end with subtitles wasn’t a direction I would have chosen, it wasn’t objectively a bad one. It was simply an artistic and creative choice made by the producers, and it didn’t really ruin anything…only dulled the impact of the Klingon-subtitled scenes from what they could have been. Not necessarily a bad thing, just not really a good thing. Neither is predictability necessarily a bad thing. There’s no law that says a TV series must have unexpected plot twists in order to be good. And I think Star Trek: Discovery is a very GOOD series. I enjoy watching each episode (even if I still don’t see it as existing in the same timeline as TOS, TNG, DS9, and VGR). But that’s just me. And I still like what I see when I watch the show. And to be fair, the production team—everyone—are all trying REALLY hard. And it shows. It’s not the creators’ fault that they have only 15 episodes to tell their story. That isn’t a lot. Game of Thrones, Babylon 5, the new Battlestar Galactica…they’ve all had multiple seasons, and that allows for a LOT more time to get the audience complacent before pulling the rug out from under them with something like the “Red Wedding” or having Captain Sheridan jump to his “death” rather than join the Shadows on Za’Ha’Dum (remember how cool that scene was when you first saw it…over TWO DECADES ago???). So I’m 100% convinced that the Lorca we’ve come to know and love(?) is actually from the Mirror Universe…and this this is where the USS Discovery has now found itself. After all, there’s only six episodes left, Frakes is directing one of them, and if this ain’t the Mirror Universe, then they’d better hurry up and get there really fast!!! Either way, we’ll find out in just seven and a half weeks, as Star Trek: Discovery returns with new episodes on January 7! One more thing I notice. When Discovery jumped, it is always shown to be jumping “downward” relative to the ship. The final jump, however, show that the ship jump “upward”. Either it’s just VFX choice, or it’s yet another clue. Didn’t notice that! Good eye, mate!!! Ohhhkkkaaaayyyy. . . Did Stamets just go Three-Eyed Raven on us with “I can see them all — Infinite permutations” after jump 133/133?